Am I the only one who commits far more errors when writing on the computer—stupid misspellings, extra words, left-out words, wrong words, inversions of words—than I ever did when writing on the typewriter? In a message that I sent just now, I intended to write “west side” and wrote “wide side” instead (and only noticed after sending the message). I do this all the time. I never used to do it at all. One cause, I know, is thought outracing fingers. By the time I was about to type out the word west my mind was already on the word side, and so I hamfistedly combined them. But still. I seem to see things differently on a computer screen. The eye scans words on a screen, but focuses upon words on paper. (You too read faster on a computer, I’d bet, but also absorb less of the content.) From a very early age, before I was even out of grammar school, I wrote on a manual typewriter, teaching myself on an old Underwood. The words I would hammer out on it, taking shape letter by letter, were tangible. They left indentations in the paper. The verso felt like braille. Is the fault my childhood training? That I never became accustomed to anything else? For years and years I stuck with manual typewriters, turning up my nose at the IBM Selectric. Even though I was a fairly early computer user—I got my first Apple IIe in 1983—by then it may have been too late. I was an old dog incapable of learning a new trick. 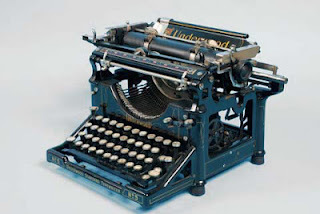 Is it only us oldtimers who are sloppier on a computer than we ever were on a typewriter? Are younger writers, some of whom may not even have heard of typewriters, blessedly free of such absent-minded errors? One piece of evidence: I rarely garble a sentence when I am copying a passage, looking down on a book at my left hand and not up at the screen. The fault, I am beginning to think, lies not in our age but in our eyes. Greetings, this is the first time I have commented on your blog, but have been enjoying it for about a few months now. As a 'mid-generation' reader (reaching the ohs above the trinities), I first thought, "Yes!" in answer to your question. But then I remembered that whenever I am carried away by an attempt to convey a meaningful thought, I may do so at the expense of grammar. This is why I value editing. It was easier to edit when my jobs were more administrative or contained: I knew what to look out for. Today, my pace and range of work has changed, and this is what I find most challenging. Could it be because the delete key is more convenient than retyping (or Tippex)? And of course spell-checking won't catch "wide side". Maybe we could print* and proof-read first, in the interests of sending or posting exactly what we mean. I've been typing since about 1959, and a regular computer user for work since 1980. I'm 48, and I first began typing (like you) on a manual typewriter. However, typing on a typewriter terrified me! I was never confident enough to compose directly onto the typewritten page; I could only type from a handwritten original. And very, very slowly... the only way I was able to get over my fear of mistyping (and then having to go through the agony of using Liquid Paper) was to type with pop songs playing loudly in the background; the distraction "freed" my fingers from indecision. Transitioning to a home computer (a Tandy/Radio Shack 1000TX) in 1988 finally conquered my fear and loathing of keyboards. I actually make far fewer mistakes typing on a computer's keyboard than I made on either a manual or electric typewriter. I too make lots of mistakes when typing on the computer. The problem for me isn't speed alone but also the knowledge that I could easily make corrections--except often I don't go back and read before I hit send or continue writing. Making mistakes when typing meant getting a new sheet of paper and starting over or plastering the original sheet of paper with liquid paper, so I was more careful. I'm fairly sure this difference applies to our thinking as well as our typing on computers.